What’s Your Cause? Here’s mine. In a few weeks I’m going to Dallas. I’ve certainly been there for business, but this is different. I’ve written a few times about the importance of family and that I bike. My upcoming weekend in Dallas hits both of these and for good reason. I’m going to ride the MS 150 – which is 150 miles over two days – with my closest cousin, who has Multiple Sclerosis. This will be my third consecutive year on the ride and fourth overall. The MS 150 is one of the most rewarding things I do and it’s an amazing experience on a few fronts. I’ll ask up front here for your support and down below. 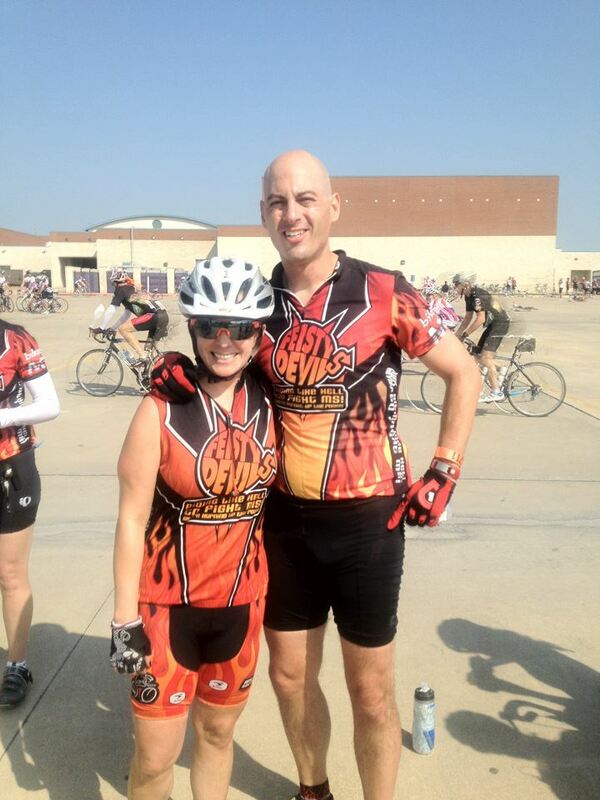 Alyce and me at the Dallas MS150 in 2012. First and foremost, I get to spend time with my cousin and her family. She’s courageous and spunky person who always gives her all and loves giving me #monopolyshit. In fact, her team’s name is the Feisty Devils and it describes her pretty well. Her husband, Doug Levy – CEO of MEPlusYOU and co-author of Can’t Buy Me Like is everything you’d expect out of an entrepreneur who wrote a book about authenticity in business relationships. Their two girls are awesome. The whole family is sold out to the Feisties in the best way and have created the largest non-corporate team on the ride. There’s also my aunt and uncle who come, another cousin who rides plus and her 60+ year mom who just decided she’d do it one year. The weekend is full of family and group events and tired people supporting a cause. Every 17 miles or so there’s a support stop where volunteers try to outdo each other. The number of people who cheer, hold your bike for you, provide food to keep you going, and make sure you’re OK boggles the mind. My favorite is the Parrothead tent close to the end of Day 1 who have virgin margaritas, Buffett music, and ice cold towels. Even when you’re hurting due to 90+ degree temperatures and brutal winds, they psyche you up to go to the next stop – as do all the volunteers. By the end of the event, I’m overwhelmed by the sheer effort and emotion. Crossing the finish line with an amazing group of people after riding all that way is a feeling like few other. I’m so proud of Alyce and Doug for reacting to her diagnosis by creating the Feisty Devils. Each year they undergo a massive organizational effort that’s all about love and riding like hell to fight MS. I hope you’ve taken the opportunity to contribute to an event like this with those you love for a cause you believe in. There’s little you can do in life like it. Thanks so much to those who support my ride by cheering me on and contributing on my behalf. If you’s like to help out, the link is below. Also, have a look at my Twitter feed @EricSchneiderGA the weekend of May 3-5 to keep track of my progress. Lastly, please support me in raising funds for this worth cause. My cause, too, beCAUSE of Alyce and you!